That’s right, the complete set of Columbo arrived for me just this morning, after I began worrying it may have been lost in the mail. This is a terrific series starring the late, great Peter Falk in the titular role. I’ve only seen a handful of episodes, watching the series sporadically, but I liked every episode very much, and now I’ll have the ability to catch up with the entire series. I look forward to it. 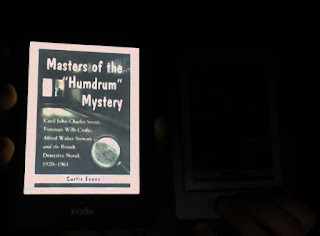 The image above is an image of yours truly holding up a copy of The John Riddell Murder Case by Corey Ford (under the pseudonym John Riddell). Alas, the book has no dust jacket. I’ve already started to read this book and have laughed uproariously. It’s a very, very funny parody of Philo Vance, which uses Vance in a story that knows it’s a murder mystery and directly breaks the fourth wall on several occasions. It’s the story of the mysterious death of John Riddell, found in his library dead of boredom, surrounded by last year’s bestsellers. When I get around to reviewing this one, you can be sure you’ll get a more complete summary. Let’s finish it all off with (arguably) the most high-profile item, my brand-new Kindle Paperwhite. 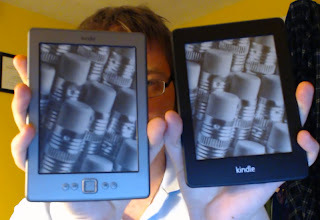 There isn’t much of a difference superficially between the Paperwhite and my old Kindle, purchased last year. 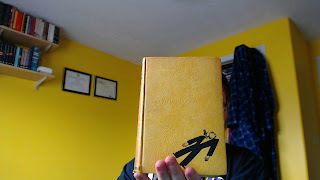 (It still runs excellently, by the way, and I gave it to my younger siblings to use.) 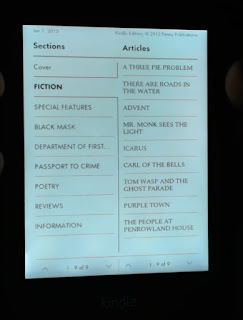 The most remarkable difference at first glance is that the Paperwhite is black and has no buttons other than the power button at the bottom of the machine. This is due to a touchscreen, which is responsive and pretty easy to use. When I turned on the machine for the first time I got a quick tutorial on how the touchscreen works, so I was never lost. 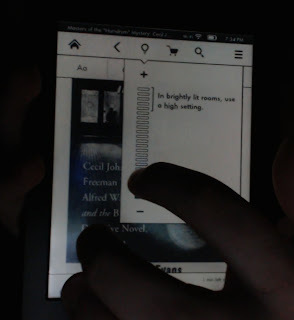 I found it every bit as intuitive as my old Kindle, and although it’s slightly heavier, after three minutes I had already forgotten this. 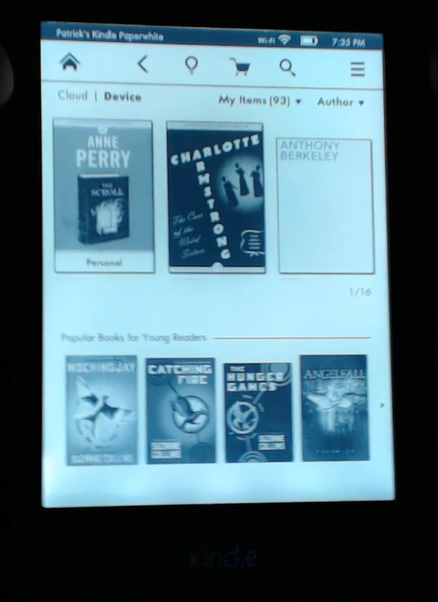 The main reason I bought the Kindle Paperwhite can be seen above: the lit screen -- which works!!! 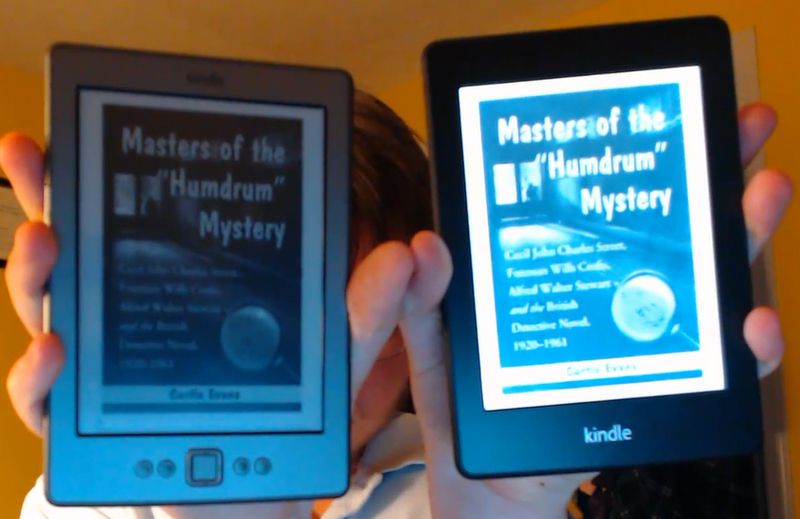 As you can see, the book displayed on both screens is the same, something I did to make this a fair comparison between the two screens. (BTW, if you haven't read Curt Evans' book, you're really missing out. Check out my review to find out more.) 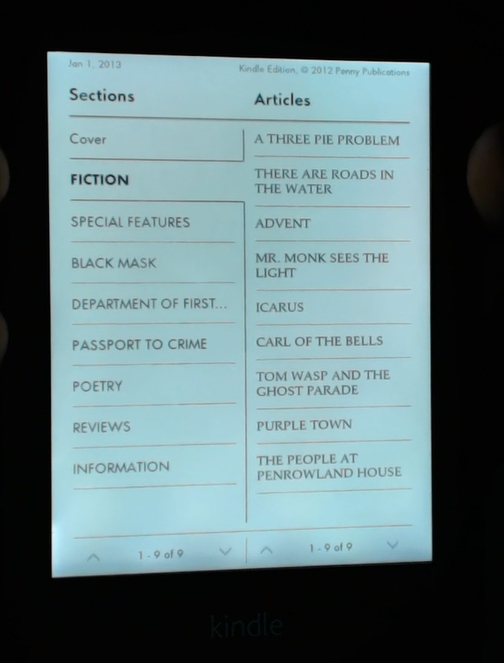 The lighting on the Paperwhite is very even, although at the very bottom of the screen (where there is no text) there are one or two small darker regions. However, this does not affect my reading experience in the least and I only noticed this when I looked for any problems with the lighting. Although the Paperwhite has been touted as having a higher resolution than the old Kindle, I honestly can’t tell much of a difference. I’m sure it’s there, but it’s not as dramatic a difference as the lit screen. There is no irritating glare from the screen, an achievement at which I can only marvel. It’s just as comfortable as reading a “book”-book, with the added bonus of not having to reposition the desk lamp just-so and having to sit in just-such a position to catch the light. The “flash” when you turn pages is barely noticeable, and the touchscreen works pretty well. 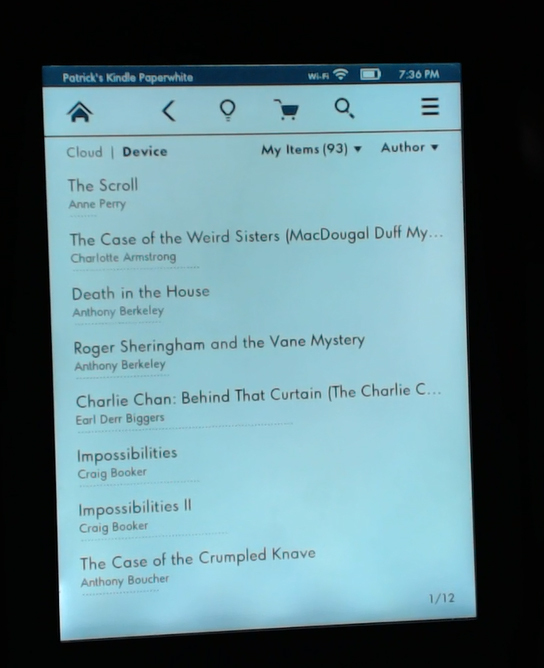 It’s almost better in a way, since it holds more books per page (eight vs. six) and you can instantly click on the book you want to open instead of navigating around like I had to on my old Kindle. 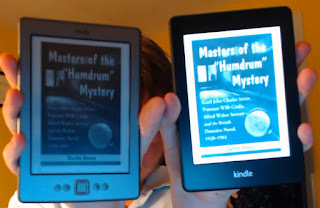 However, I confess I just really like the look of the book covers, so I have gone with the first option. Although if I get annoyed enough, I’ll probably change it back to the list view. I really like seeing the magazine’s contents this way, with illustrations and enticing little snippets showing up to whet my appetite for the current issue. 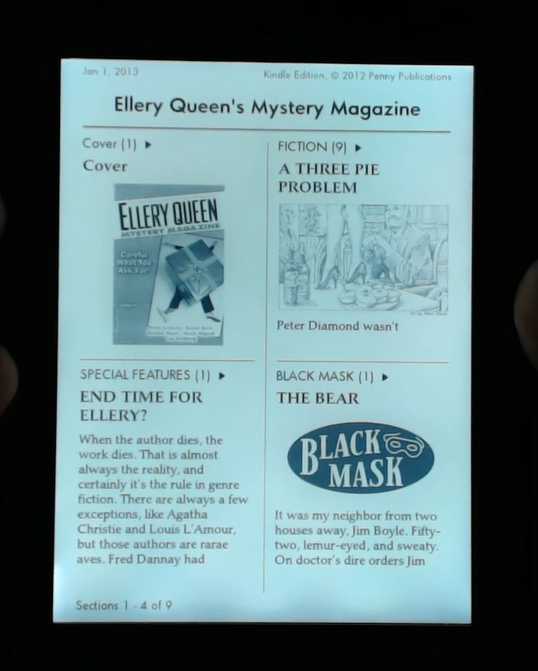 I’ve also got all my back issues on the Paperwhite, and plan to keep them for the excellent reason that it’s EQMM—it’s high quality stuff! The only problem I have had with the Kindle is that occasionally, when opening a very complex Kindle book (such as Ian Ker’s biography of G. K. Chesterton), the screen will occasionally freeze up on me. I can only assume that this is due to the large file I was reading at the time, since it has only happened with the very big books with a complete table of contents, images, etc. It hasn’t gotten to annoying levels, and has only happened three or four times, but it’s something to keep an eye on. Well folks, that’s all from me for now. Hopefully you have enjoyed this look at my newest acquisitions. Let me know what you think and feel free to ask for more details if you like! I found this really informative (and of course I thought the choice of examples was fantastic). Now I have one more thing I want for Christmas... Thank you, Patrick. Patrick, since you seem to enjoy Columbo so much, I want to make some recommendations here. At least these other sleuths in the same mystery wheel, Banacek and Quincy, should greatly appeal to you. 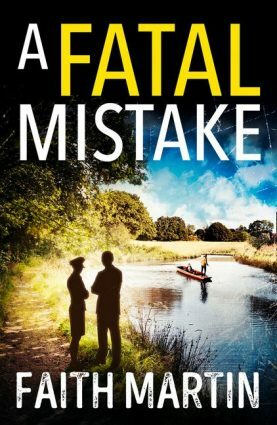 Banacek is an impossible theft expert, investigating insurance related cases for a huge fee.Quincy is a medical examiner-turned-detective, a forerunner for all CSI style series. And check out Jonathan Creek , another british expert on impossible crimes.